Namco × Capcom[a] is a tactical role-playing (RPG) crossover video game developed by Monolith Soft for the PlayStation 2 and published by Namco in 2005. The gameplay combines tactical RPG and action sequences during battles, featuring characters from video game series owned by Namco and Capcom. The narrative sees Reiji Arisu and Xiaomu, operatives for paranormal investigative group Shinra, confront distortions bringing characters from other realities into their own. 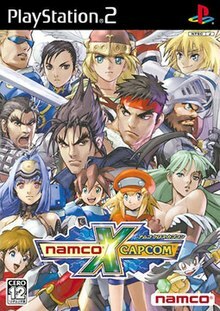 ^ ナムコ クロス カプコン (Japanese: Namuko Kurosu Kapukon), pronounced as "Namco Cross Capcom". This page was last edited on 16 April 2019, at 01:51 (UTC).